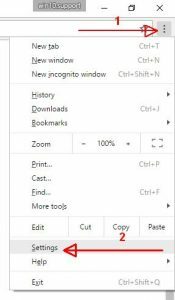 Open the Google Chrome menu and select Options. The block System, remove the tick from the Use Hardware Acceleration (if available). After removing the bird appears on the need to restart Chrome. Click on the link in the message. After the reboot, most likely you will not see an error page: Oh, no! Google Chrome s’ha quedat sense memòria en provar de mostrar aquesta pàgina web. Segona variant de resoldre tal problema és instal·lar Google Chrome 64.